Blank Oak Dining Set with Hans Wegner Chairs and Møller Table, 1965. Blank Oak Dining Set with Hans Wegner Chairs and Møller Table, 1965. 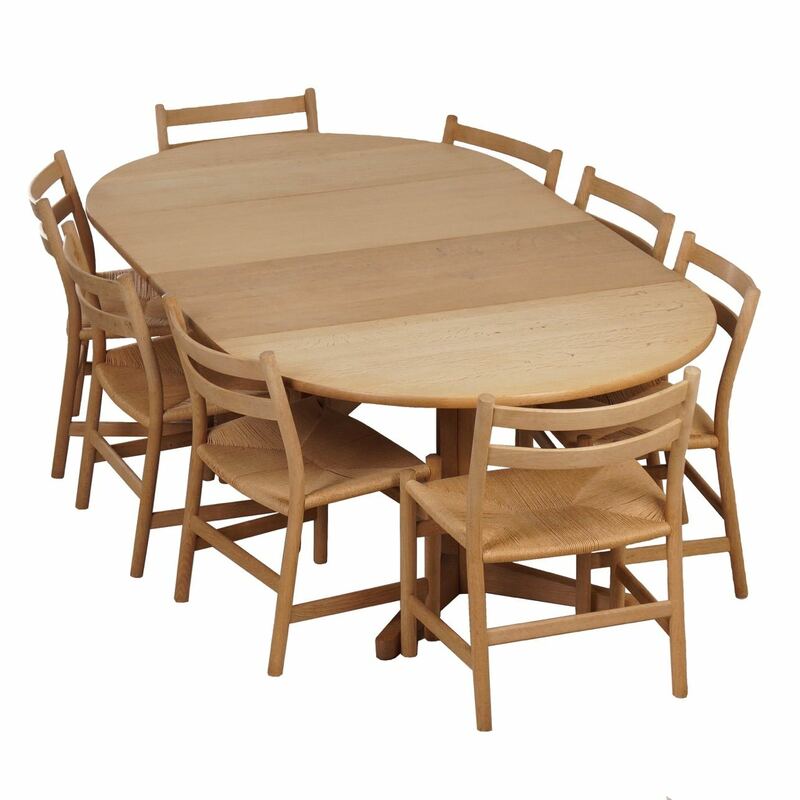 Blank Oak Dining Set with eight CH47 Hans Wegner Dining Chairs and large, extendable Møller Table, 1965. The CH47 dining chairs are designed by Hans Wegner model and made by Carl Hansen & Son in 1965. These elegant dining chairs are made of solid oak and have a durable hand-woven paper cord seat. This set is still in very good condition and the seat’s have recently been re-upholstered with new paper cord. These chairs are also sold new again and cost new 800 euro per chair. The extendable dining is designed by Niels Otto Møller and in very good condition as well. There are two in between leafs of which one is somewhat discolored (see photos). Dimensions (h x w x d): chairs 78 x 55 x 50 cm, seat height 42 cm, Moller table 70,5 x 223/172/120 cm. The price is for the set of eight chairs and the table. It is possible to buy the table or chairs separately.